The extracting Workshop is full. I do not have anymore openings. We will be having our annual extracting work shop in a couple weeks. It will be limited to 50 people. Please first time attendees only. What is happening: There will be two groups. 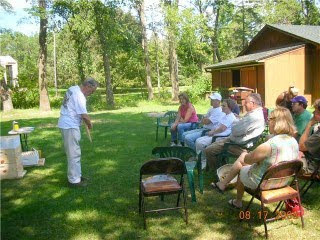 The first group will learn how to pull honey, treat for mites, and winter their bees. The second group will go into the honey house. We will then switch. 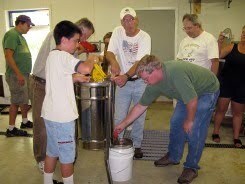 In the honey house we will be demonstrating how to uncap, extract, strain and bottle honey. Everyone will bottle a jar of honey to take home. How: The workshop is open to 50 people please call (RSVP required) and reserve a spot. No young children please. I have been noticing the White Sweet Clover starting to wane. While the spotted Knapweed and Birdsfoot Trefoil is in full bloom around the Stillwater area. If anyone living near a swampy area may be enjoying the nectar from Purple Loostrife. The honey from Purple Loosestrife looks like new motor oil, a greenish hue. The flavor is appealing. This time of year the intensity of the flow will diminish and it may even end in some areas. I usually watch the supers and make sure there is an empty one on top but no longer put them on two at a time. By the first of August I watch the supers to make sure there is some empty frames in the supers. Having the bees finish filling the boxes usually happens then. But is important to make sure there is some empty frames. Keeping an eye out for a new flower bloom can change this strategy if nectar starts coming in on a new heavy flow. A new Alfalfa, Sunflower, Golden Rod or other late summer flow may surprise a beekeeper with more nectar coming in. Watching the supers with a quick peek will keep us ahead of any late summer surprises. When in doubt throw a super on. The temperatures and this summers steady moisture may bring an August nectar surprise. There is still nectar coming in but it starts to be localized to areas that have the right nectar producing flowers. A beekeeper sent me this email about entering a county fair for competition in the honey division. My response follows. I entered a pint of honey for the heck of it this year in the a County Fair. I was the only one that brought honey…I received a second place ribbon with no explanation or feed back. When I brought the family to see the fair, I asked them for feedback and they couldn’t provide any, said the judge who was brought in was especially picky and used the state criteria. When I read the state fair book online, it doesn’t really go into prep detail. I am just looking to learn because it was my first time. It was decanted twice, caramelly red amber honey with hardly any froth and suspended pollen. Debris at the bottom was nil. No air bubbles, but I did notice that someone had handled the jar and smudged it up with finger prints after I had cleaned the jar at drop-off time. The ring and lid was a preserves lid brand new. Any suggestions or info would be great. Might be a handy blog post for others. What did the premium book for the honey entry say? You have to follow the entry criteria to the letter. Was the bottle full? If it says one pound of honey they will weigh it. If there is froth on top that is undesirable, points off. Any debris in honey, points lost. Moisture content above 16 %, points lost. As the moisture goes up the points go down. Color of honey. If it is off color of the entry i.e. Light amber and it is lighter or darker, points lost. Does it taste like honey. Any off flavor will cost you points. All of these little things add up to a total score. It is hard to get all the points in every category, but you can get most of the points with attention to detail. At the State Fair an entry in a canning jar would be disqualified. Remember this is competition. The judges are looking for a quality product. Care has to be put into every jar. The State Fair entry is 12 one pound jars. Uniformity is key. They ask for glass or plastic jars. The glass will get higher points when the judges put the jars in front of a polara-scope. I do recommend every beekeeper enter the fair it makes you a better bottler and you will turn out a better quality product because you learn how to do it. It is unfortunate that you did not get input from the judge because it is how you learn. At the State Fair you will get a score card so you know how your entry stands. They also have a novice class that will make a easier possibility of a ribbon your first time. Check out class 97 in the Ag-Hort-Bee premium book. At the end of every class entry there is a score criteria for what the judges are looking for and the points rewarded. That is great you made an entry. It helps the whole beekeeping industry when we can show case our products. Plus you may win some money and bragging rights of having award winning honey. I was out checking supers yesterday. I had to come up with some more supers. Most of my hives have 4 supers on them, a few have 5 and six. Of course I have a couple bad performers that have one super with nothing in it. There is really nothing else going on other than dealing with cut comb. I have pulled my cut comb as it gets capped. If the cut comb is left on to long the capped wax will get a yellowish color called pollen stain that is from the bees traveling over it. While there is nothing wrong with this, a nice white capped comb section does sell better. Remember when pulling off comb honey it is important to stuff green grass in the spout of the smoker. This acts as a filter to prevent little pieces of black charcoal from landing on the comb honey. The small amounts of charcoal are easy to spot on the white comb and difficult to remove. Spotted Knapweed is starting to bloom around Stillwater. 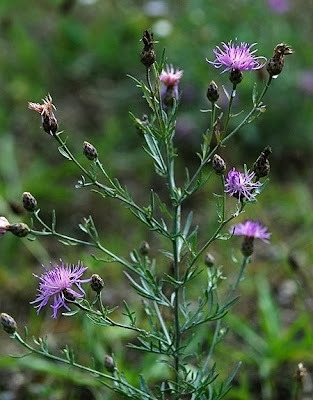 This purple weed is considered a noxious weed by the DNR. It can spread into sandy soils and is invasive. It looks similar to a Bull thistle. There seems to be more of the weed every year. I don't recommend propagating this invasive weed but if the bees happen to get some honey off it so be it. The honey from spotted knapweed has a buttery flavor. I do like the taste of this honey. "Thanks for planting the clover Jim"
I have all of the supers I own on my hives. This nectar flow for many of us may be the best in many years. I have talked to many beekeepers who are experiencing the same. 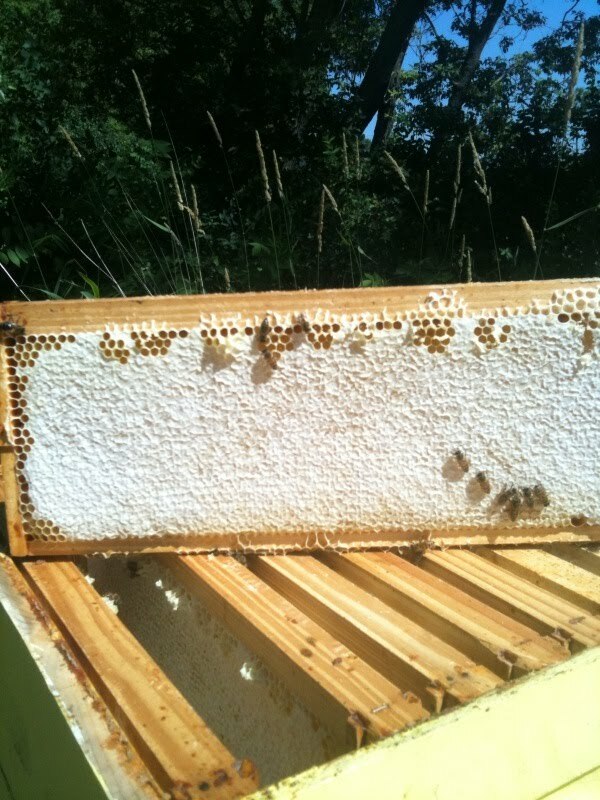 Over wintered colonies are performing best but many of my packages are doing well. I have a few dogs that have not put up any honey but that always happens when you run 50 colonies. The dogs have either swarmed or gave me some queen trouble early on. It seems this year if the queen was ok and the hive didn't swarm most of the colonies are putting up some honey. White sweet clover is still in full bloom in this area. Other flowers will still be coming. The second hay crop has been cut. We may see a third cut of alfalfa. So there may be more of that available in late July or early August with the good rain we have been getting. A beekeeper called me to report he saw goldenrod starting to bloom west of the cities. A past post about Growing Degree Days is coming true with August flowers blooming earlier than normal. How this effects our nectar flow is unknown but the way it has been going I am going to have to extract and put my supers back on. For the first time in more than a decade, New York’s beekeepers are claiming their summer perches on the city’s rooftops. Bowing to a citywide campaign, the Department of Health and Mental Hygiene recently removed honeybees from the Health Code’s register of “venomous insects” and other prohibited animals. Not surprisingly, the New York City Beekeepers Association saw a sizable bump in enrollment for its spring classes. Yet without support from City Hall, it’s doubtful that we can return to anything like the pre-ban era, when hives could be found at city schools, on the roof of the American Museum of Natural History and even inside Radio City Music Hall. The benefits of urban beekeeping are substantial. Despite the conventional view of the city as a slough of pollution, urban honey is likely to have significantly less chemical residue than commercial honey made beyond the boroughs. This is partly due to the high levels of pesticides in commercial agriculture and partly because small-scale beekeepers tend to use fewer drugs in the care of their hives than commercial operators. Urban honey also has the potential to be a godsend for New Yorkers with allergies. Although the scientific studies are still lacking, there’s plenty of anecdotal evidence that the pollen in local honey helps people develop defenses against local allergens. Then there’s the health of the city. Take the honeybees of East New York Farms!, an organization of urban farmers and neighborhood farmers’ markets. These Brooklyn bees pollinate crops for the entire neighborhood. They aren’t just making honey: they’re building community, creating income and employment and maintaining vital urban green space. Local honey will benefit the health of the planet as well: minor transportation costs, no-fuss manufacturing (courtesy of the bees), minimal processing, simple recyclable packaging and centralized retailing provide a model of effective, low-carbon production and distribution. Beekeeping isn’t as daunting as one might think. The humans require a bit of training, but bees are famously self-sufficient, needing little more than the right location, a supply of clean water, some feeding in spring and fall and a weekly inspection throughout the summer. Nevertheless, there are still significant obstacles to city beekeeping, and it’s uncertain that, without the government’s help, it will reach beyond a relatively limited stratum of committed New Yorkers. For one thing, unless you own your building, your landlord has to approve the hive’s installation, and he has to feel confident about the reactions of the tenants and the roof’s ability to support a 250-pound hive box. Then there are the costs: around $250 per hive, plus about $200 for the bees, the protective suit and other equipment. And even though the image of bees has softened in the wake of colony-collapse disorder, popular fear of bees is ever-present. So what can City Hall do? For starters, like other cities in the United States and overseas, New York could support urban beekeeping through small grants, through tax incentives for both beekeepers and building owners, through public education programs and by getting hives into city schools as educational and perhaps fund-raising tools. Beekeeping could also be promoted as a part of FoodNYC, a plan devised by Scott Stringer, the Manhattan borough president, to support grassroots efforts like green rooftops and urban farming. These efforts are already altering the ecology and economy of the city in small ways; with the right citywide support, they could have a far greater effect. As anyone who has studied a beehive knows, it’s an ordered, self-sufficient world, a reminder that nature is always in our lives, even in the middle of the city. And there is nothing quite like your first open-air taste of fresh, local honey, sparkling with flavor, straight from the source. More New Yorkers should get that experience. Hugh Raffles is an anthropologist at the New School. 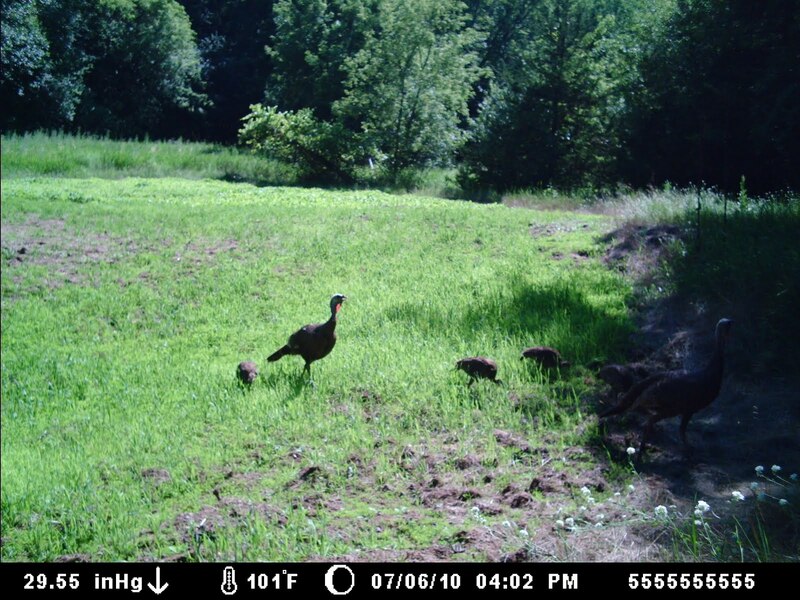 I have my trail camera running. Last week I was woken up to a big cat snarling in the woods near my house. Of course I really wasn't interested in a close personal encounter so I stayed inside. The next night I put my camera out. I heard two days later of a cougar sighted in Stillwater by two different people. I hope I can catch a picture of it on my trail camera. I have added a search tool above. This may help you find an archived post easier. I was out checking my supers today. I had two supers on most of my colonies. Many were almost full so I added two more to everything. The weather next week looks perfect for nectar collecting. I have been getting reports of many beekeepers having a stellar year for honey collection. 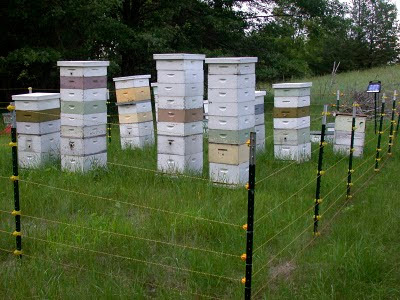 Several beekeepers saying that their over wintered colonies have four supers full and were adding two more. Many were looking to breakout ladders to add supers. 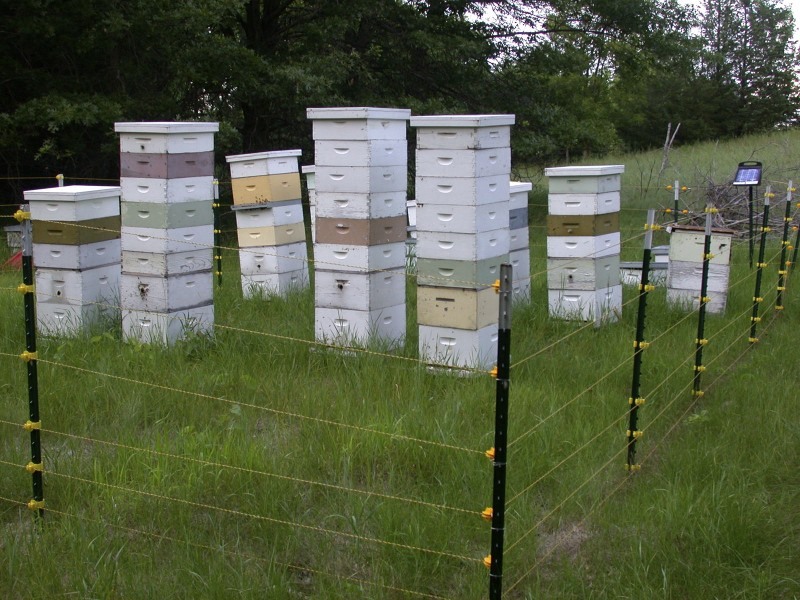 While adding supers with ladders is very impressive, safety in the bee yard is important. If the supers get too high you can take full supers and put them on neighboring colonies if they are under performing. They will take care of the honey until it is time to extract. Now is the time we want to exploit the bees hoarding instincts. Keep ahead of the bees with more empty supers and they will try to fill them up. If supers are full, the bees may stop collecting honey, swarm or plug up the brood boxes with honey or a combination of all three. If the supers get full and there are no more supers there is three options. Extract the full supers and put them back on. Put on deeps for supers if you are expanding next year. The bees will get a head start next year with drawn comb to work with. This is the second super off the honey bound hive that has recovered and making honey. A few weeks ago a beekeeper called me about a hive that became honey bound. They became honey bound from swarming. He put a new queen in but she had no place to lay eggs. and they are starting in the third super.